To bring you (and me) back up to speed on where I left off, on my first day (June 3) I headed down (and up) the Tanner Trail. 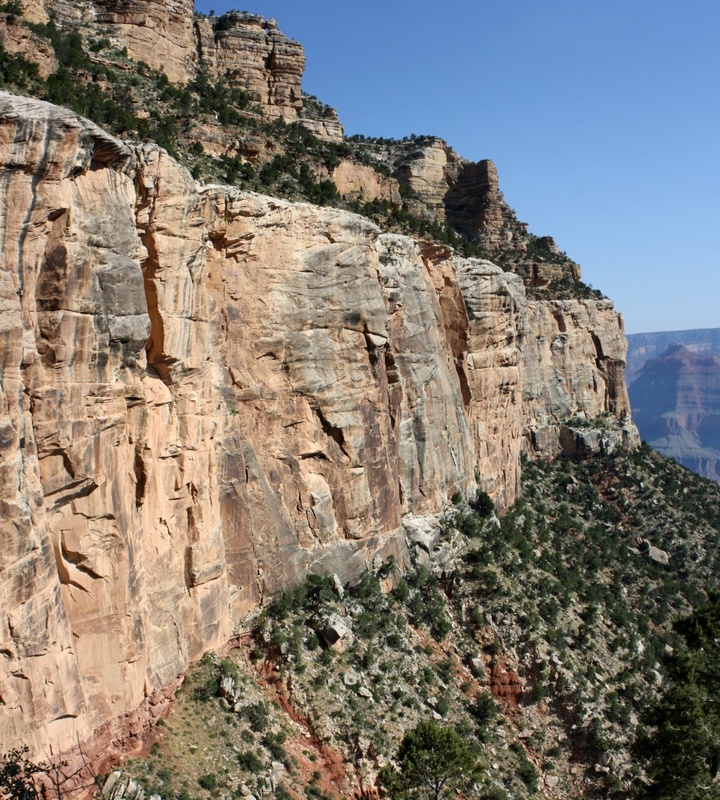 The next day (June 4) I mainly did siteseeing, riding the buses along the rim and also doing short stretches of the rim trail. 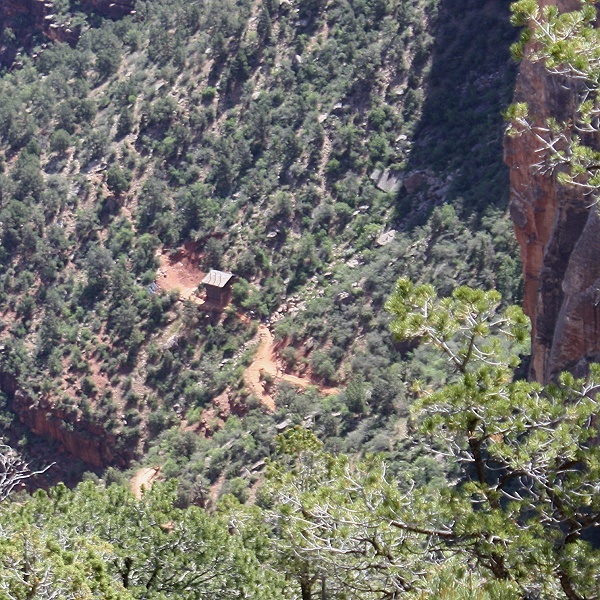 Following that, on June 5 I decided to take one of the Ranger-led hikes down to the Cedar Ridge restrooms. Because of the heat and need for water, I was trying to finish my hiking before the heat of the day; that’s why they were shorter. 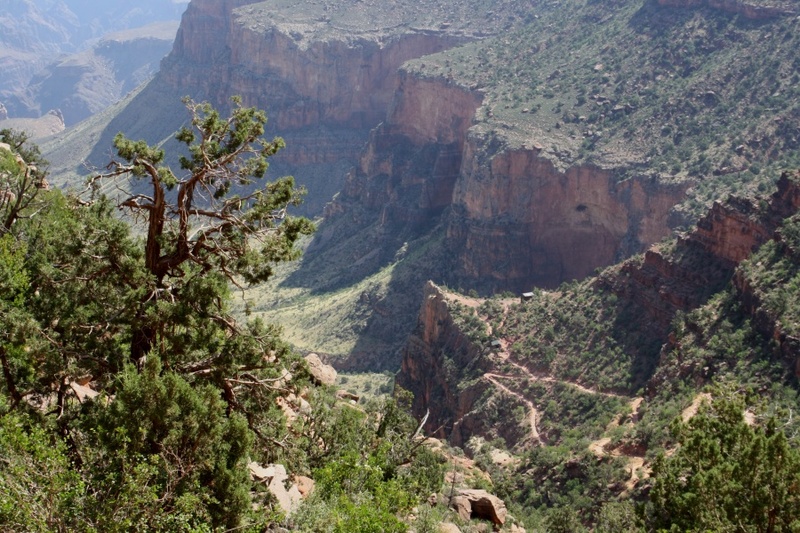 So, instead I just decided to head down the Bright Angel Trail as far as I felt like and then head back up. 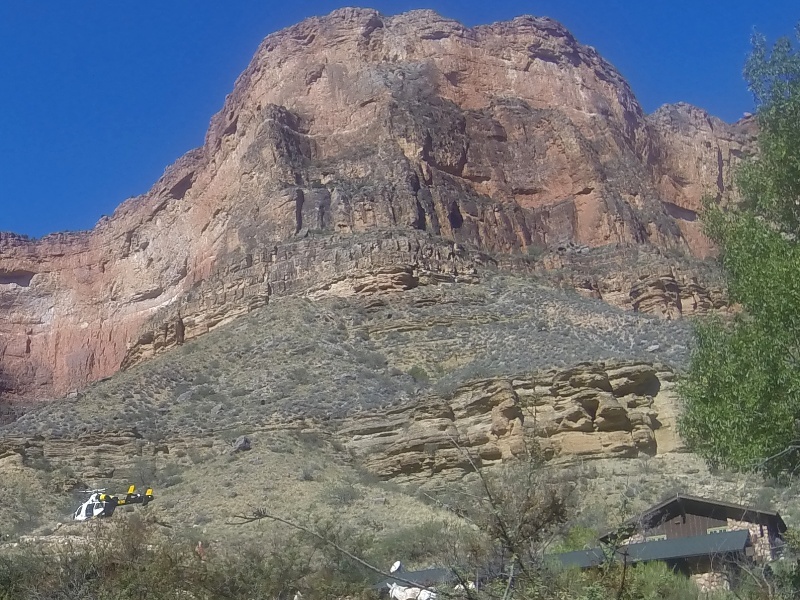 This would be a new experience for me—in past trips I had only ever hiked up the Bright Angel. 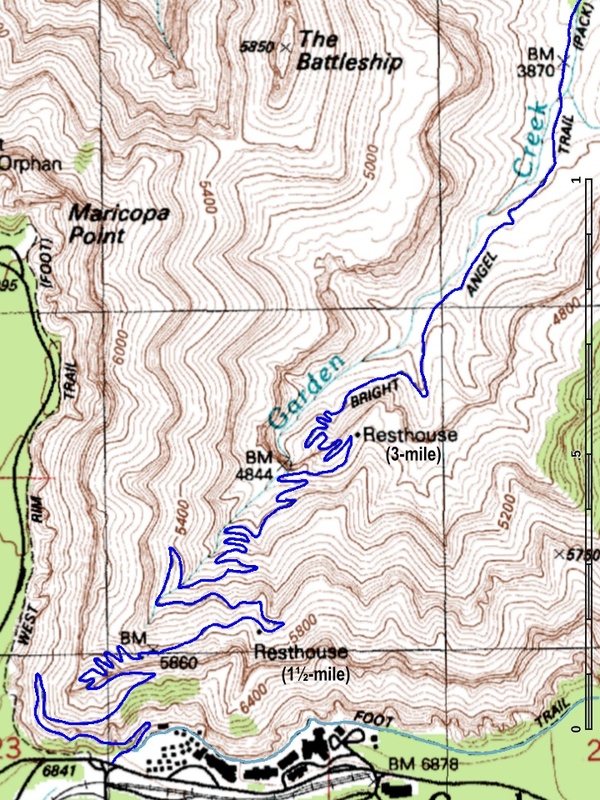 Also, this would be a hike with easy water access at the 1½-mile Resthouse, the 3-mile Resthouse, and, if I decided to go that far, Indian Garden. I started down the trail at around 9:00 in the morning. I’d gone down just a bit when I took this shot looking down towards Indian Garden (where that green patch is). 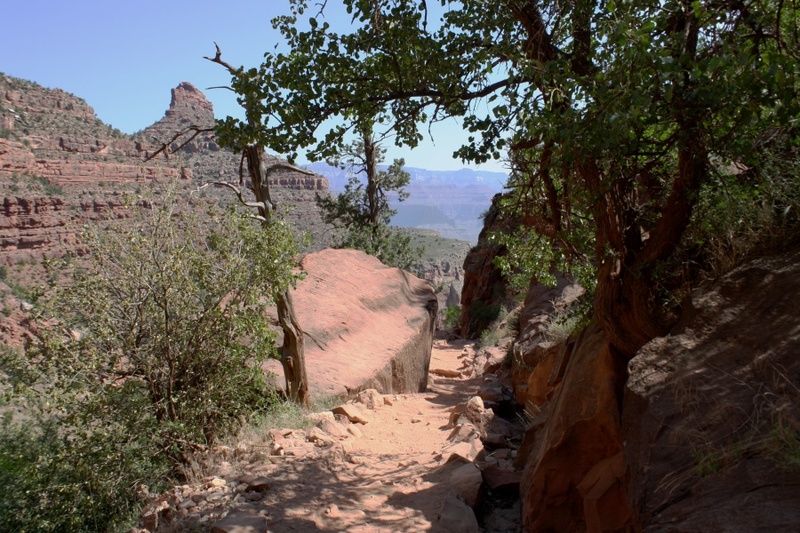 Further along in that direction you can see the trail heading out to Plateau Point. Keeping in mind my newly found (and newly appreciated) knowledge that the trail headed down a geological fault, I made sure to look back up. Once you know it’s there, it’s obvious. You can see how the equivalent rock layers are offset quite dramatically. It took me about half an hour to be down alongside the Coconino Sandstone layer. It’s so huge I had to stitch together two pictures to get this. 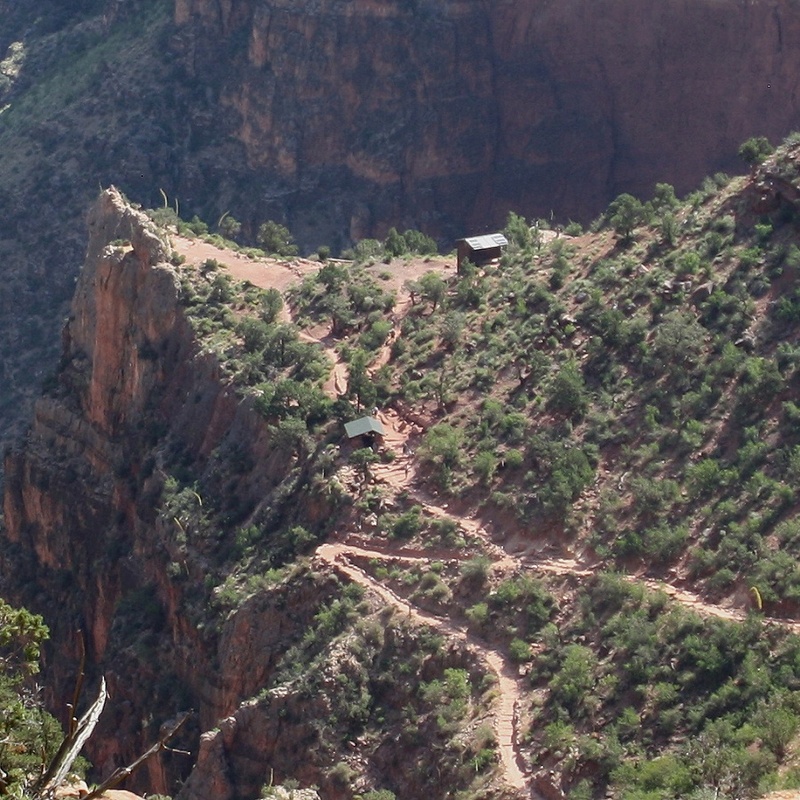 I started at an elevation of about 6,900 feet and was first heading down to the 1½-mile Resthouse, at about 5,700 feet. 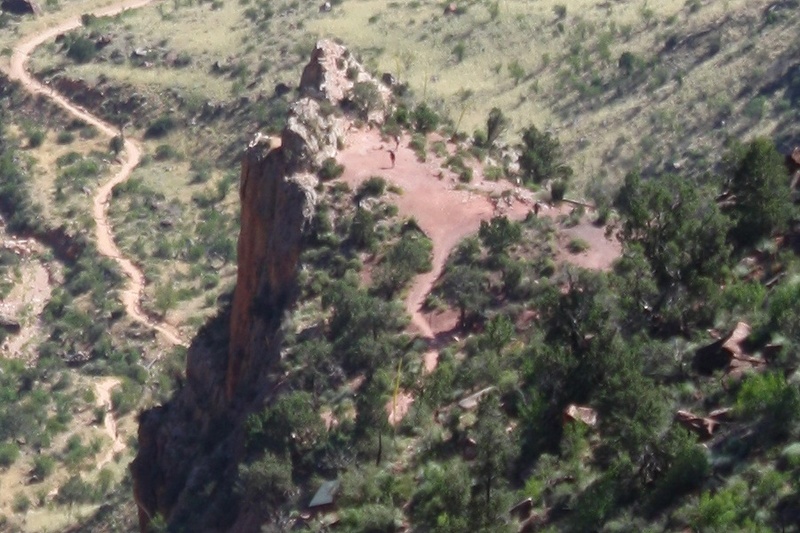 Here’s a look from above, where I’m using the picture I took a few days ago from the rim and digitally zoomed and cropped it. 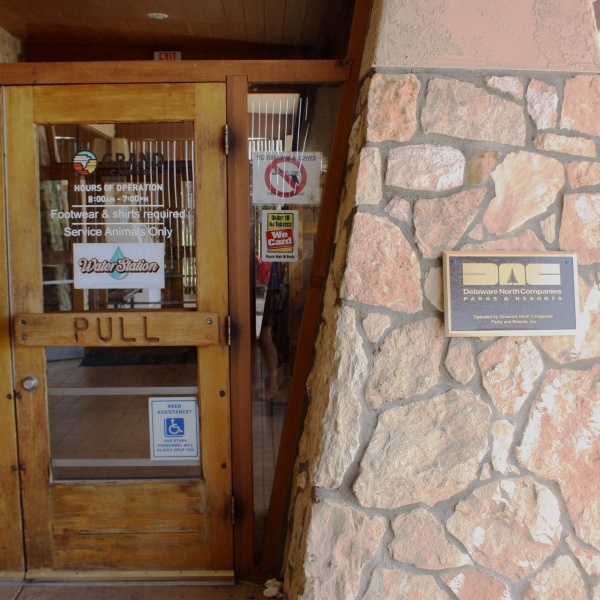 What you are actually see there are the restrooms. The Resthouse itself is hidden behing the trees to the right. As I was heading down, I was hearing from folks working their way back up, “The water is broken at the 1½-mile Resthouse.” I was having trouble figuring out how the pipe could be broken just there, but it was also making me think that I should 1) conserve the water I had (2 liters); and 2) seriously think about whether I should head all the way to the 3-mile Resthouse. 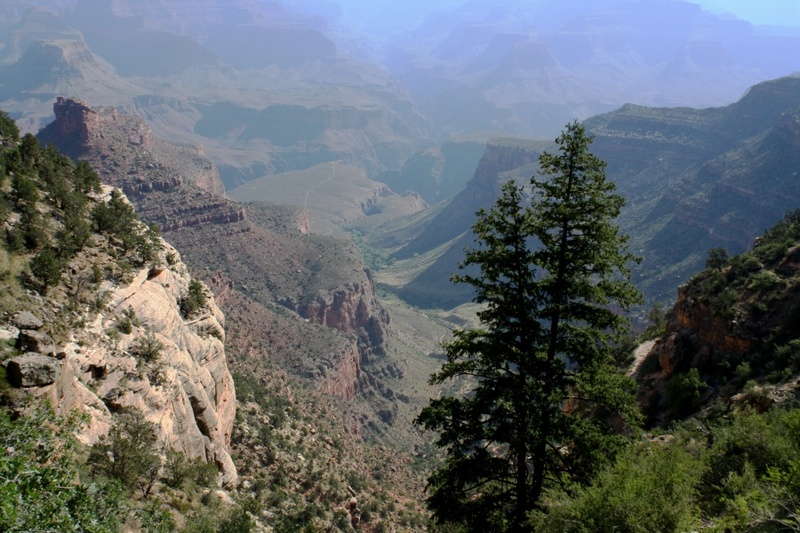 When you head down into the Canyon, they always tell you not to trust that you can get water at the various spigots. I guess this is why. It took me about an hour to get to the 1½-mile Resthouse. Here I am in front of it. Why am I standing so stupidly? Hellifino. I think I was just trying to highlight that I was hiking barefoot. You can see that little puddle on the right. That’s why there wasn’t water at the Resthouse. 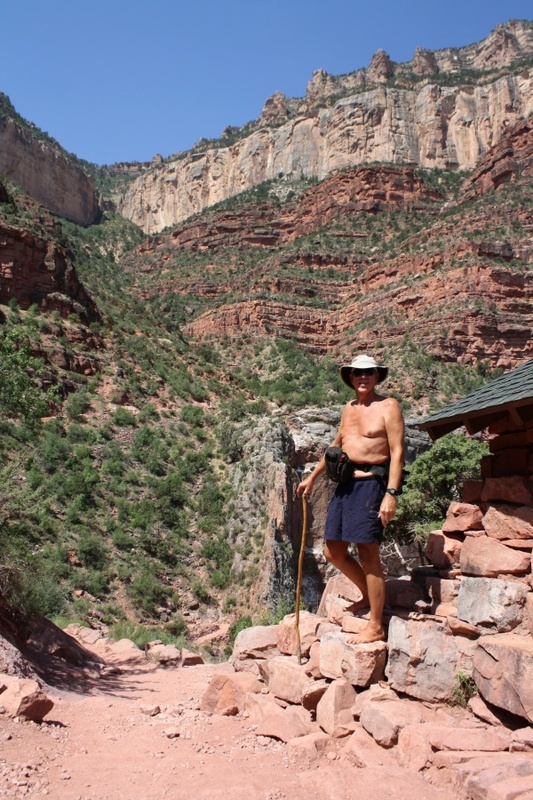 The main pipe (which runs from Roaring Springs on the North Rim, down to the bottom, and then back up (more-or-less) along the Bright Angel Trail) was not broken at all. What had broken was the small feeder pipe that led from the main pipe to the Resthouse. There was a Volunteer there helping us to at least dip our hats in the leaking water to help keep us cool. I’d actually met him on my trip the day before down to the Cedar Ridge restrooms. He (and another Volunteer) had shown up while we were at the restrooms. Volunteers are all along the trail to try to talk people out of doing stupid things (like going too far down when it is hot, etc.). I still had over a liter of water left, so I thought that making the 3-mile Resthouse ought to be easy (and I knew it had water so I could refill). So I continued down. 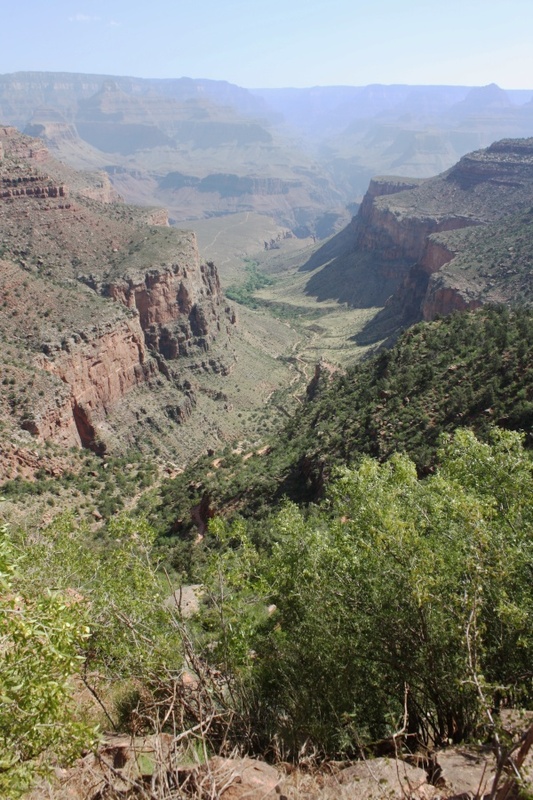 About 5 minutes later I was crossing Garden Creek (or would have been if it had any water in it), elevation around 5,500 feet and got this great view down the Canyon towards Indian Garden. 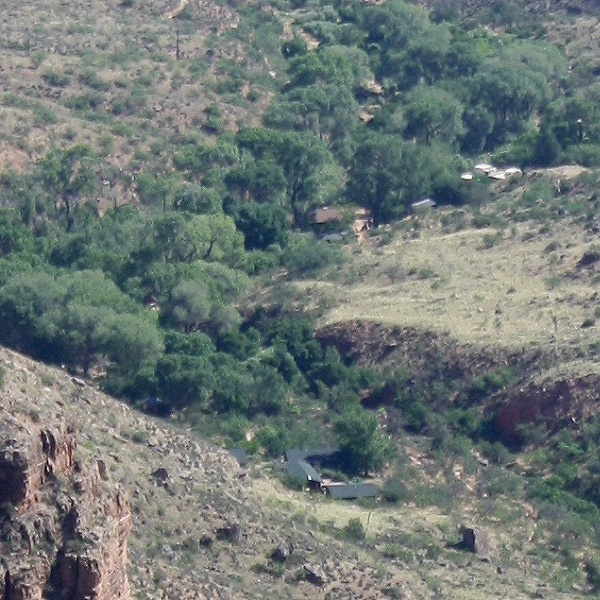 What’s kind of cool about that shot is, if I zoom the area that is green with trees, you can see the Indian Garden Ranger Station and Campground. You might recognize those nearer buildings from a picture I took last year on my way up from the bottom, when there was a helicopter (lower left) just taking off from the helipad on the hillside. There’s something else in that long-range shot: you can see the 3-mile Resthouse on a promontory sticking out over the valley. Not too long after that picture, I made it to the big switchback at 5,400 feet. From there there is another good view of the 3-mile Resthouse (on the left) and a bunch of the switchbacks leading to it. Here’s a map to help you orient yourself. 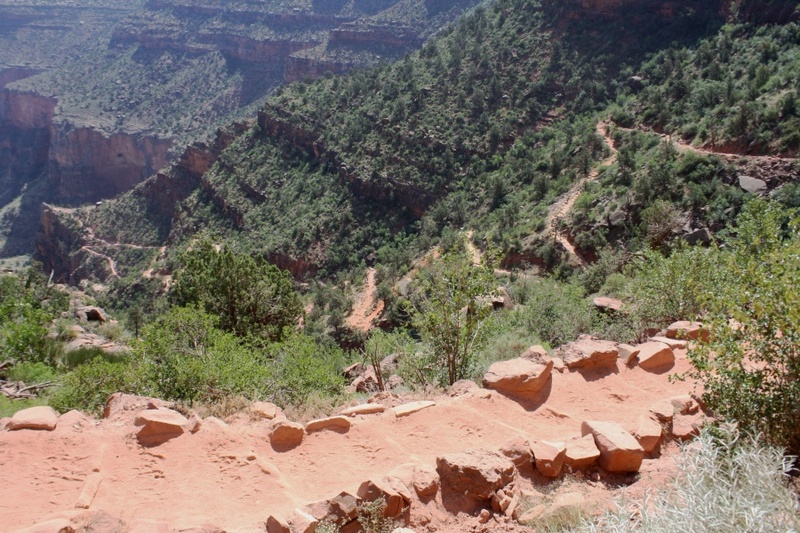 Did you ever wonder why those are called switchbacks? 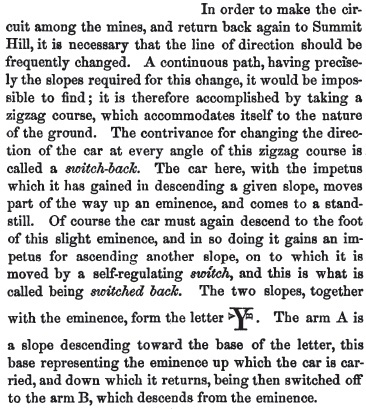 In order to make the circuit among the mines, and return back again to Summit Hill, it is necessary that the line of direction should be frequently changed. A continuous path, having precisely the slopes required for this change, it would be impossible to find; it is therefore accomplished by taking a zigzag course, which accommodates itself to the nature of the ground. The contrivance for changing the direction of the car at every angle of this zigzag course is called a switch-back. The car here, with the impetus which it has gained in descending a given slope, moves part of the way up an eminence, and comes to a stand still. Of course the car must again descend to the foot of this slight eminence, and in so doing it gains an impetus for ascending another slope, on to which it is moved by a self-regulating switch, and this is what is called being switched back. The two slopes, together with the eminence, form the letter AYB. The arm A is a slope descending toward the base of the letter, this base representing the eminence up which the car is carried, and down which it returns, being then switched off to the arm B, which descends from the eminence. I do wonder what such arrangements on trails were called before the railroad. I also find it interesting that the name of the town also fits within my interests. It’s a Lenni Lenâpé (Indian) name. I’ve written about such things here in How the Hocking Got Its Name and How the Licking Got Its Name. That “unk” on the end is a dead give-away as a locative suffix. Mauch Chunk is a corruption of “machk-tschunk“, which means “Bear Mountain (the place)”. It’s made up of “machk” (or “màxkw“, with the “x” a guttural), “wach-tschu” (or “òhchu“), and “unk” (or “ink, ing, or ung, as a locative suffix). Slide them all together and the best an English speaker can come up with is “Mauch Chunk”. But you won’t find Mauch Chunk on a map. Back in around 1953, when Olympic Gold winner and Native American Jim Thorpe died, his wife Patricia had him buried in Mauch Chunk (because supposedly Oklahoma, where he was born and lived, refused to build him a monument). This was not totally out of the blue, since Jim Thorpe had gone to the Carlisle Indian Industrial School nearby. So, Mauch Chunk built him a monument, and renamed the town after him. So look instead for Jim Thorpe, PA. So now you know. Think of it every time you are hiking and come across a switchback. 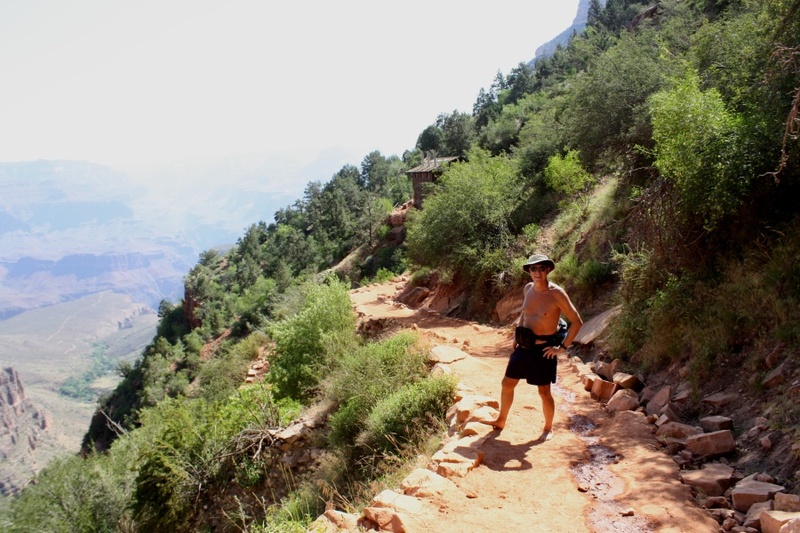 Let me continue my way down into the Grand Canyon. Here’s another view of the 3-mile Resthouse. That prominence in the upper left is “The Battleship”. And here I am at the 3-mile Resthouse. 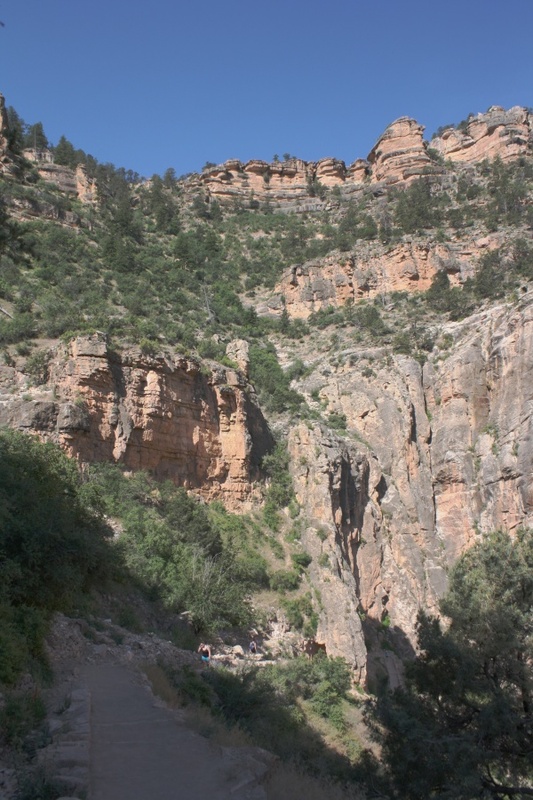 I made sure to position the picture taker looking back up the Canyon so you can see where I came from. The other Volunteer that I’d met at Cedar Ridge was at this Resthouse. He (an old Marine) wasn’t too happy with my being barefoot (but what was he going to do?). Oh, yeah. What was I going to do when I lacerated my foot (according to him)? The fact that I’d been doing this for 20 years didn’t seem to get through to him. Oh, well. From here I decided to head back up. It had been a fine hike. It had taken about 2 hours to get down (so now it was just past 11:00am). As usual, I didn’t manage to do much picture-taking on my way back up. 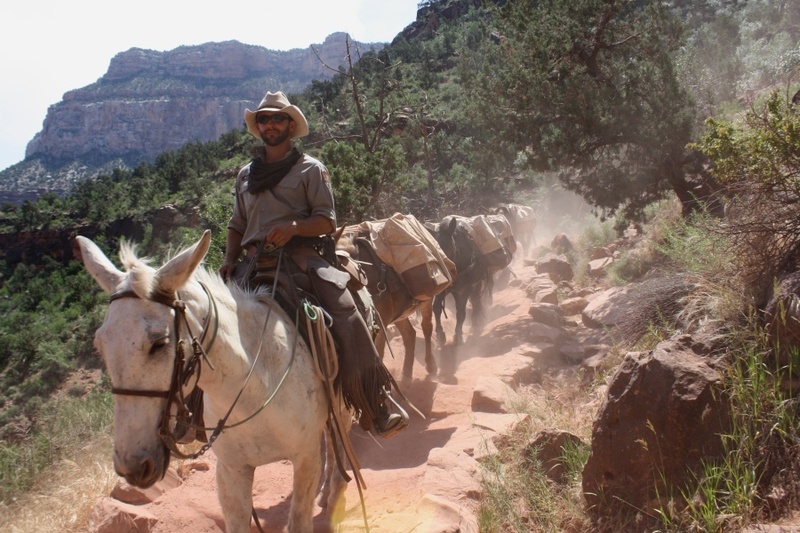 However, about 20 minutes into my ascent, I met a mule train coming down. 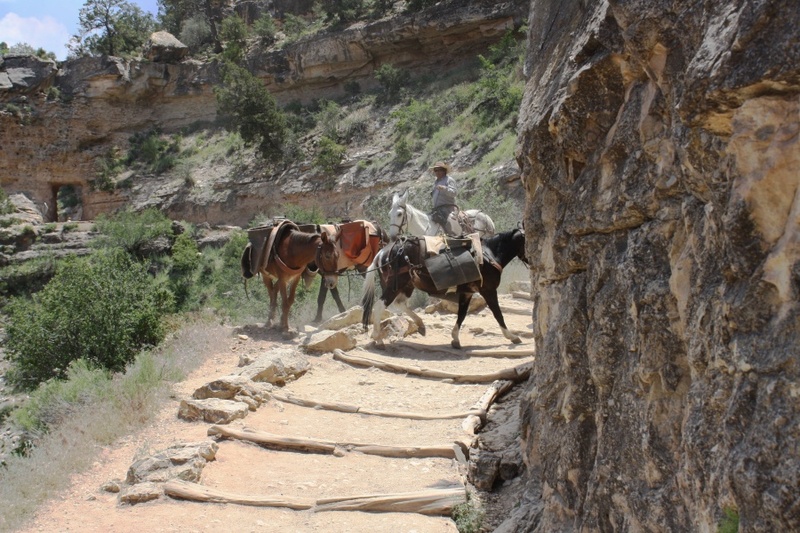 Then up near the top, at the upper tunnel, I came across more mules. You may recall that they were doing maintenance on the trail. They were bringing down dirt, dumping it, and then turning around. Yup, that’s what they’re doing. I made it back up to the top right around 1:00pm, so that was 2 hours going down and 2 hours coming back up. Again, my lungs and muscles are in better shape than my knee joint. I rather goofed off the rest of the day. Had lunch at Desert View in a place with a “Footwear & shirts required” sign. Good way to end my visit.